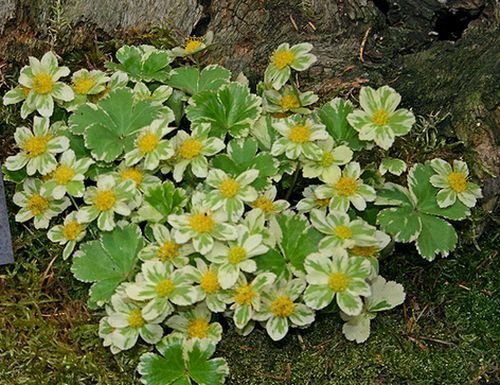 There is only one member of the Hacquetia genus and it is a hardy perennial. It grows from about 5 to 10 cm in height, making it ideal for use in the rock garden. Hacquetia flowers at the death of winter through the beginning of spring. It carries a yellow flower, and unusually, this will appear before the leaves do. Hacquetia epipactis by Rictor Norton & David Allen. Flowers: Late in winter through to early spring. Flower Details: Yellow. Umbels. Daisy-like. Six bracts. Foliage: Herbaceous. Lime green. Variagated. Sow Outside: Surface. Autumn using new seeds. Spacing 8 to 10 inches (20 to 25 cm). Sow Inside: Germination time: one to six months. Temperature: 55°F (13°C). Mix seeds in a moist growing medium, place in a freezer bag, then stratify by refrigeration for three weeks. Sow into the chilled seeds into flats about three months in advance. Transplant outdoors just before the last frost. Requirements and care: Full sunlight or shade; best results with dappled shade. Good drainage through to boggy. Humus rich, moist soil. Spring mulch. Once established do not disturb. Protect from slugs. Propagate: by dividing in the spring. Miscellaneous: Synonymous with Dondia. The colour of the bracts brightens when they are ready to be pollinated by insects. Hacquetia seeds should be sown fresh in the autumn on the soil surface. They can grow in both shady and sunny areas of the garden, and prefer soil that is moist yet has good drainage. You can start to grow Hacquetia plants indoors first, but this requires a little work. The seeds should be imbibed in moist soil, put in a black bin bag and refrigerated for 3 weeks. The seeds should then be sown in flats and kept at about 13 degrees Centigrade. Germination can take anything from one to six months. Once you have grown some Hacquetia plants they can be put into the garden before the last frost of spring at a spacing of about 25 cm. If you require more Hacquetia plants then they can be divided in the spring time. Spring is also a good time to supply mulch to the Hacquetia plant to keep the roots cool in the summer.